By most accounts, China is the global leader in internet banking and financial technology (fintech) investments. Fintech’s relevance in China will be on full display this month—during last year’s Chinese New Year holiday week, consumers used Tencent’s WeChat app to send out more than 30 billion digital red envelopes. Chinese search provider Baidu Inc. in January became the latest technology giant to open a direct bank, joining forces with investment firm China CITIC Bank to form Baixin Bank. Baixin will offer online-only banking and lending services for consumers and small businesses. With this launch, Baidu joins internet giants Alibaba and Tencent Holdings (together, BAT) in offering direct banking through online banks. Tencent, which runs China’s largest social network WeChat, formed WeBank in 2014. Alibaba introduced two of China’s most successful fintech ventures in MYBank and Ant Financial. Other Chinese companies are following BAT into the internet banking foray. In late December Xiaomi, one of China’s biggest online smartphone sellers, bought a 30 percent stake in Sichuan XW Bank, a major internet bank in Western China which leverages data to target small-businesses and consumers. Meituan.com, a website that specializes in group buying, also formed an internet bank called Jilin Yilian Bank, which received its banking licenses on Dec. 16. Fintech investments surged to $8.8 billion in the twelve months ended June 30, 2016, according to a joint report by DBS Bank and consultancy firm EY. In early 2016, Ant Financial alone raised $4.5 billion, the largest single private placement in fintech history, putting a $60 billion valuation in the Alibaba-affiliated company. In total, fintech attracted around half of all of Chinese venture capital during 2016. The major internet banks have performed well financially relative to other startups. In an interview with Chinese media last December, WeBank CEO Gu Min said that financial performance was above expectations and the internet bank was on track to break even or eke out a small profit for 2016. Fintech’s growth in China is largely an extension of services from BAT, China’s dominant technology giants. There are more than 700 million smartphones in use in China. Those three companies control much of the online and mobile life of Chinese internet users, and converting millions of captive users already in the fold is an evolution of their product strategy. But the pervasiveness of fintech isn’t just about sheer numbers. In the United States, Facebook and Amazon.com both have millions of captive users, but the companies’ banking and payment services are still in their nascent stages with low adoption rates. The biggest growth enabler of fintech and internet banking is the traditional banking industry in China. The major banks’ complete neglect of large swaths of consumers, small businesses, and private enterprises has single-handedly spurred recent rise of fintech in China. The phenomenon is akin to consumers in parts of Africa quickly moving from having no telephone service to widespread mobile phone adoption, skipping land line service entirely. China’s big banks generally focus on serving local and regional governments, state-owned enterprises, and large private companies. Despite being the world’s second-biggest economy, one in five of China’s adults doesn’t have a bank account, according to the DBS and EY report. Bank access for consumers is especially poor outside of major cities. Besides solving the access issue, online banks provide consumers with cheaper and more tailored, customized products. Small and medium-sized businesses make up another segment overlooked by major banks. While accounting for 60 percent of China’s GDP and 80 percent of urban employment, they make up only 20 to 25 percent of total loans originated by banks. Despite being the world’s second-biggest economy, one in five of China’s adults doesn’t have a bank account. This under-served sector has been a major benefactor of internet banks in recent years. During the first eight months after its launch, MYBank said it disbursed over 45 billion yuan ($6 billion) of credit to over 800,000 small to medium-sized businesses. Large banks also haven’t kept pace in digital infrastructure. The consultancy McKinsey & Co. estimated that major Chinese banks only invested 1 to 3 percent of their pre-tax income to new technology and digital innovations, far below the 17 to 20 percent earmarked for technological innovation at global banks outside of China. 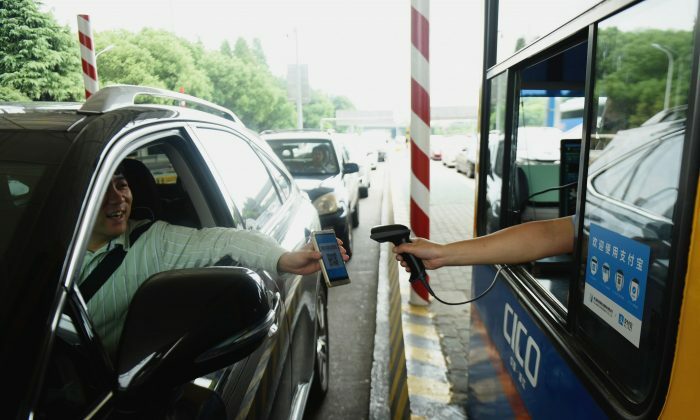 The Industrial and Commercial Bank of China, the country’s biggest bank by assets, has recently upgraded its mobile apps and online access, but such services are only available to its corporate clients as of now. The growth of internet banking in China has also seen its share of problems. Peer-to-peer (P2P) lending is one area within fintech that fizzled in 2016 after explosive initial growth. Ezubao—at one time China’s biggest P2P lender—turned out to be a Ponzi scheme, defrauding almost $8 billion from 900,000 investors. The company’s collapse set into motion new regulatory rules issued last year to regulate P2P lender activity, including requirements to register with the state, appoint bank custodians, and disclose their use of deposits. P2P’s rise and fall underscores the risks of fintech’s quick growth in China. Internet banks must receive banking licenses, and fintech solutions provided by major companies such as BAT are often self-regulated and have large internal credit departments. But other corners of fintech—a broad term that covers everything from mobile payments to online wealth management—are lightly policed and often little understood. Regulators have often been slow to react to market trends and sheer number of new companies formed.